Historical information about the surname Harland. This is an Anglo-Saxon locational name with its origins in any of a number of minor places named from the Olde English pre 7th century “har”, meaning “grey”, or “hara” meaning “hare”, plus “land” for “land” or “patch of country”. Locational surnames were usually given to the lord of the manor, to the local residents and especially to those who left their original homes and went to live or work in another village or town. On July 28th 1555, Alicia, daughter of Thomae Harland, was christened at Howden, Yorkshire, and the marriage of Johanne Harland to George Mallerye, took place on August 11th 1560, at Filey, Yorkshire.© Copyright: Name Orgin Research www.surnamedb.com 1980 – 2010. Letter sent to Dalesman magazine by Michael Booth in Australia. in Oct 2011.How I enjoyed the article on Hackfall. My association with Hackfall goes back through my mother, now deceased some forty years, a cousin of the Harland family who lived at Victoria House in Mickley, Ripon. She used to visit them from the early 1900s. I was born in 1939 and well remember bus trips to Mickley in the 1940s and 1950s and my favourite schoolboy expedition was always to explore Hackfall. The majority of the trees had been felled and the challenge was to get all the way through to the other end and walk to Grewelthorpe. The halfway point was Barrows field, a favourite blackberry picking spot in season.In my early visits, a tree in the corner leading to the second part of the woods still stood and on it were carved my mother’s and father’s initials and a love heart. They were married in 1917. Next stop was Fisher’s Hall, or just plain Fisherman’s Hut to me, and Mowbray Point was always extremely difficult to find, but well worth the climb. Mum always talked of other places she could remember as a young girl – grottoes and fountains and the like – but all seemed to have been re-claimed by the vegetation.The path through to Grewelthorpe was a real challenge but, in later years when I was old enough to imbibe, a welcoming pint in the Crown was the ultimate prize. But then there was always the return trip.Moving to Oz in 1974, I thought my days of visiting Hackfall were over but a holiday in1989 saw me back there for two visits with my wife of twenty-five years. We managed to find our way through to Fisher’s Hall on both occasions. It hadn’t changed.Hackfall holds such a special place in our family that my eldest sister, who passed away aged ninety last September in Townsville, requested that her ashes be scattered – where else but in Hackfall.Michael H Booth, Busselton, Western Australia. Thanks to Margaret Pemberton for letter [Jan2014] re Esther Harland. I was interested in your genealogy site, where found the baptism details of my Great-great-great grandmother Esther Harland (5.5.1782). In 1807 she married Thomas Thorpe of Masham (whose parents were Anne Gregg and ‘Thomas of Grewlthorpe’. She died Masham 7.8.1853.> Esther and Thomas’s son, Joseph Thorpe was born Masham 6.111819 and died in Bradford 26.12.1875.> He married Margaret Brownrigg who was born on the Isle of Man. Their son, John Thorpe was born Bradford 1.5.1843 and his daughter, my grandmother, May Thorpe, was born 1.5.1883’ I’m sending this info just in case anyone else in the Harland family tree connects with it and is interested. Though living in retirement in Whitstable, I was born in Bradford and so am still a Yorkshire girl.. The following details of Harland families living in the Grewelthorpe area. Information taken from Parish & School records & census returns. If you can add any information to this page please contact the web site. ALFRED HARLAND. Born C1862 Mickley. Married in C1884 to Mary. He was a Horseman in Brough Catterick in 1911. ALFRED E. HARLAND. Born 19.10.1907. Dairy Farmer living Westhoe Farm Galphay in 1939 married to Mary [born 1872]. AGNES HARLAND. Born C1789. In 1841 living Grewelthorpe. A straw Plait dealer. AGNES HARLAND [nee ?] Born C.1804.. Died Nov. 1842 Patrick Brompton. Wife of Robert of Grewelthorpe. Photo of grave at end. ANGELA HARLAND. Born 2.12.1962. Dau of Gordon. ANN HARLAND. Bap. 22.5.1785. Dau of Thomas. ANN HARLAND [nee ?]. Born C 1786 Pateley Bridge. Wife of John of Felliscliffe. ANN HARLAND. Born C 1836 Osmotherley. Dau of Matthew & Elizabeth. Living Azerley 1851. ANNIE HARLAND. Born C1899 Masham. Dau of George & Isobel. Living Leeds 1911. CAROLINE HARLAND. Born 29.3.1964. Dau of Gordon. CHARLES HARLAND. Born C 1836 Killinghall. Son of John & Ann. Living Ripley 1851. EDMUND HARLAND. Born 19 June 1877. Burniston. Living Kirkby Malzeard 1891 son of Thomas of Morton on Swale & Annie. In 1939 living Avoza Cottage Grewelthorpe with Elsie & Gordon Cole. He was a horseman. ELIZABETH HARLAND [nee?]. Born C. 1812 Glasgow. Wife of Matthew the Flax Dresser. ESTHER HARLAND. Bap. 5.5.1782. 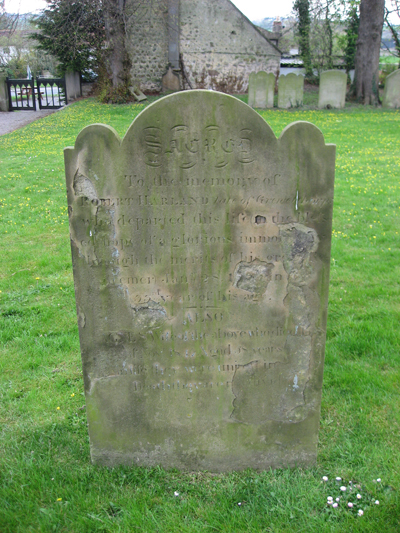 Died 7.8.1853 Masham. Dau of Thomas. Married Thomas Thorpe. of Masham. Their son Joseph moved to Bradford. HANNAH HARLAND. Born C. 1837 Cumberland. Dau of Matthew & Elizabeth. Living Azerley 1851. HERBERT HARLAND. Born 1 July 1872. A retired wood sawyer living Mickley in 1939. Married to Margaret A, [born 1879]. ETHEL HARLAND. Born 1900 Mickley. Dau of Herbert & Margaret Alice. 1911 in Azerley. ISABELLA HARLAND. Of Grewelthorpe, single woman was charged with being found in the house of Joseph Wright for an unlawful purpose. Jane Wright said that her husband’s house and Isabella’s joined each other. Early morning Jane went to work in the fields, but a heavy shower forced her home, on arriving at the house she heard a noise upstairs, and she discovered Isabella in the garrett. Jane said she had misseditems previously like bacon bread etc. Isabella said she was looking for rats to destroy them. She wasn’t believed and was called a rogue and a vagabond and was sent to the Wakefield House of Correction for 2 months hard labour. Ref. Yorkshire Gazette June 1849. FANNY HARLAND. Born C1860 Pateley Bridge. Dau of Thomas [earthenware dealer]Married William Keighley. a Quarryman from Idle. Bradford. GEORGE HARLAND. Born C1873 Durham. Married Isabel of Bedale in 1893. Had 4 children alive in 1911. living in Leeds. HARRIET HARLAND. Bap. 10.5.1886. Died as infant. Illeg. dau of Harriet a servant. HERBERT HARLAND. Born 1873 Mickley. Married to Margaret Alice. of Leeming Bar. 1911 living Azerley. Wood sawyer. JANE HARLAND. Bap. 2.1.1779. Grewelthorpe. Dau of Thomas. JANE HARLAND. Born C. 1835 Osmotherley. Dau of Matthew & Elizabeth. Living Azerley 1851. Flax Spinner. JOHN HARLAND. Saddler in Kirkby Malzeard. ref. Baines 1822 Directory. JOHN HARLAND. Born C. 1796 Felliscliffe. Husband of Ann of Pateley [Bridge]. Ag Lab in Ripley in 1851. JOHN HARLAND. Ref. Pigots Directory 1829. A Linen & Woollen draper in FisherGate Ripon. JOHN HARLAND. Born C1849 Mickley. Married in 1883 to Elizabeth from Lancaster. JOHN HARLAND. Born C1894 Bedale. Son of George & Isabel. JOHN LESLIE HARLAND. Born 21 July 1920. Buried Mickley 18.11.1993. Lived Victora House, Mickley. Possibly related to Margaret Alice of the same address. In 1939 he was an unmarried Gardener. JOSEPH PAUL HARLAND. Born 10.6.1961. Son of Gordon of Hutts Cottage. Attended Grewelthorpe school from 1966. LILY HARLAND. Born C1903 Mickley. Dau of Herbert [Wood sawyer]& Margaret Alice. 1911 in Azerley. MARGARET ALICE HARLAND [nee ?]. Born 15 June 1880. Leeming Bar. Buried Mickley 25.2.1960. Lived Victoria House, Mickley. Married to Herbert. [Wood sawyer] b.1873 Mickley. In 1911 had 3 children Wm. Ethel & Lily living in Azerley. Possibly the Mother of John Leslie Harland of the same address.See letter from Michael Booth above. Report in Leeds Intelligencer Dec 1933. MARY HARLAND. Bap. 26.2.1792. Dau of Thomas. MATTHEW HARLAND. Born C. 1802 Whitby. Husband of Elizabeth from Glasgow. Living in Azerley in 1851. Flax Dresser. MAURICE HARLAND. Born 30.7.1930. Died Jan. 2018 in Bradford. Son of Edward of The Cottages, Grewelthorpe. Admitted to Grewelthorpe school on 29.4.1935. Left for Ripon Grammar school in 1941. See item “2 boys killed by bomb” in History section of this web site. Maurice was an apprentice joiner with George Thirkill & son in the 1940’s. He worked with Harold Hall. Letter from son Glenn Harland [Feb 2018]on Notices page. RACHEL HARLAND. Born c 1768 Thornton Watlass. Living Kirkby Malzeard in 1851. She was the Aunt of George Thirkill. [b1841]. RICHARD HARLAND. Born C1831 Ripon. Married Annie C1910. Living Keighley in 1911. ROBERT HARLAND. Lived Grewelthorpe. Died 28.1.18?? Patrick Brompton. Age 33. Husband of Agnes. See photo of grave at end. SARAH ANN HARLAND. Born 26.3.1871. Dau of Thomas Harland of Azerley. Admitted to Grewelthorpe school on 7.5.1883 having previously been at Burneston school. STEPHEN HARLAND. Born 25.8.1965. Son of Gordon. Attended Grewelthorpe school. THOMAS HARLAND. Born C1721. Buried 18.3.1811. Thomas was a basket maker. He left a will which had been made 25.6.1810. Proved 22.3.1811. He also owned land at Low Moor Grewelthorpe. Ref. Enclosure award 1782. THOMAS HARLAND. Bap. 5.9.1776. Son of Thomas.The following report appeared in the York Herald April 24 1830.The Pauper Thomas Harland a well dressed respectable looking man stated that at Candlemas 1821 he hired as servant to his brother, a straw plait manufacturer at Grewelthorpe for 1 year. That he received 2/6 as a Gods penny, and his meat and clothes for 1 year, at the expiration of which he had a fresh agreement. On being cross examined the pauper said that in Oct 1822 he went into Scotland, but not because there was a charge of forgery against him, he had been in the 3d Lt Dragoons and left them by walking out of the barracks on the night of Aug 28 last. He was sure he had slept above 40 nights at Grewelthorpe. during the year 1821 altho he had 4 journeys to go on business. He addressd letters to his brother at Newton le Willows, altho he lived at Grewelthorpe, this he did at his brothers request because he went to Newton every Sat. night. Mr Alexander [prosecutor] said he would prove perjury on the part of Harland. He called the brother of the pauper & 2 females from whose testimony it appeared that Harland had during the year 1821, did not sleep 10 nights at Grewelthorpe, altho he swore that he had slept 46 nights. The court quashed the order. Harland was taken into custody on a charge of perjury, but we understand he was later liberated. THOMAS HARLAND. Ref. Pigots Directory 1829. A grocer & Tallow Chandler in Queen St. Ripon. THOMAS HARLAND. Born C1811 Masham. Earthenware dealer in 1881. in Pateley Bridge. Living with Fanny his married daughter. THOMAS HARLAND. Born C. 1849 Morton on Swale. Living Buck House, Kirkby Malzeard 1891. Married to Annie of Gateshead. WILLIAM HARLAND. Bap. 4.9.1788. Son of Thomas. WILLIAM HARLAND. Buried 27.5.1795 Grewelthorpe. Son of Thomas. WILLIAM HARLAND. Born C 1843. Buried 6.8.1875 age 32. Lived in Leeds. Buried at Grewelthorpe. WILLIAM HARLAND. Born 1898 Mickley. Son of Herbert [Wood sawyer] & Margaret Alice. 1911 Living Azerley. Grave of Robert & Agnes Harland. Patrick Brompton grave yard.